This memorial is one of two or three which were formerly set into the parapet of the bridge across Port Creek. SHORES TO RESCUE THE ARMY FROM DUNKIRK IN 1940. It is not known when this plaque disappeared, nor do we have any information about the two or three other plaques that were formerly also sited on Portsbridge. Indeed we only know there were more than one plaque here as the outlines of at least two can still be seen on the parapet. The News published an article on June 1st 2010 appealing for information about the plaque but none was forthcoming. 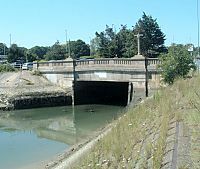 The newspaper's attention was drawn to the missing plaque by local historian Jane Smith who has written The Book of Hilsea saying it would be appropriate if the memorial could be returned in time for the 70th anniversary of Dunkirk. She also went on to say she thought this was the only memorial to Operation Dynamo (the code name for the Dunkirk evacuation) in Portsmouth.